Students and contract workers completed construction on GA Tech’s entry into the Solar Decathlon competition. 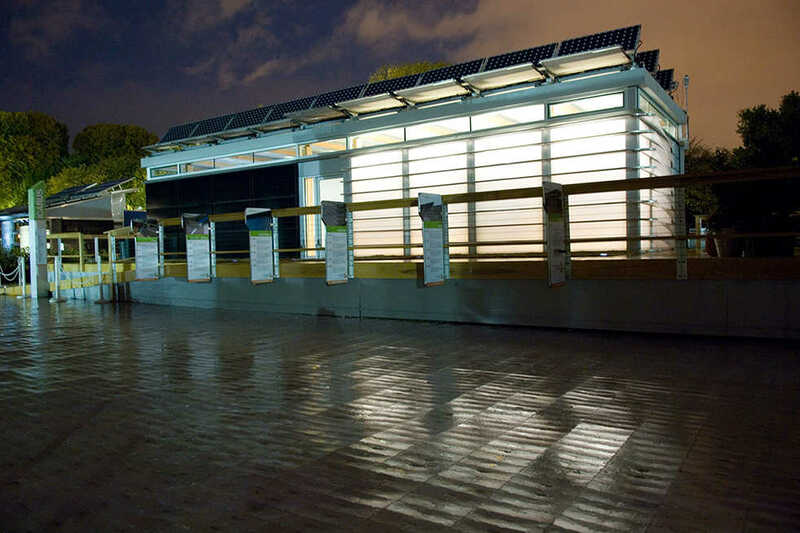 The house was open for tours on the Mall in Washington, D.C.
With solar-powered houses offering paths to renewable energy, the Department of Energy’s biennial Solar Decathlon competition is generating multidisciplinary activity within teams in 16 different colleges across the nation. Alex Poux, a second-year ME, is leading the Tech team selected to enter the 2017 competition. The house built will be temporarily shipped to the competition site for judges to score as well as for display to the public. Located in Cartersville, Ga., Icarus still stands as Tech’s 2007 entry and has been open for touring and educational purposes. For instance, the “home life” contest tests if the house can provide “15 gallons of hot water from the shower in 10 minutes or less at several times over the competition.” Aesthetic elements of the house are also part of the comprehensible examination. In building an affordable, marketable and feasible solar-powered house, Tech students will investigate concepts such as the Internet of Things, Heat Recovery Systems, Phase Changing Materials, Solar Technology and DC Microgrid. The team’s composition calls for broad range of disciplines. Electrical, Computer, Mechanical, Chemical and Biomolecular, Materials Science, Civil and Environmental Engineerings as well as Computer Science and Business majors are welcome. Helping to maintain the levels of collaboration required to keep the team streamlined for the competition are the VIP’s advisors Matthew Realff, Ph.D., and Cassandra Telenko, Ph.D.
More than 130 collegiate teams have presented their houses in Solar Decathalons, and the competition has expanded its presence in Europe, China, Latin America and the Middle East.